This security poster illustrates the OZM-72 Russian Anti-Personnel Mine. This mine is the largest of the Russian bounding mines, and it can be initiated either by trip wire or electrically. The mine has off-set fuze adaptor which allows a variety of fuzes to be used. This security poster features the technical specifications of the OZM-72 Anti-Personnel Mine, illustrations and explanations regarding how to disarm the mine, a sectioned OZM-72 with NM fuze, a side view of the OZM-72 with a shipping cap on the fuze adaptor, the striker and anchor wire connector, an OZM-72 with bakelite MUV-2 fuze, and an OZM-72 milliseconds before detonation where the anchor wire has cocked and released the striker. A sectioned OZM-72 with NM fuze. Side view of the OZM-72 with a shipping cap on the fuze adaptor. An OZM-72 milliseconds before detonation where the anchor wire has cocked and released the striker. An OZM-72 with bakelite MUV-2 fuze. The striker and anchor wire connector. Illustrations and explanations regarding how to disarm the mine. The technical specifications of the OZM-72 Anti-Personnel Mine. 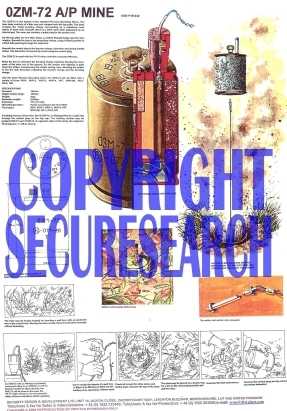 This security poster features the technical specifications of the mine, illustrations and explanations regarding how to disarm the mine, a sectioned OZM-72 with NM fuze, a side view of the OZM-72, and an OZM-72 milliseconds before detonation.